When I see the word corbel, I think of these -- scroll-decorated, garlanded bits of masonry jutting out from the face of buildings. 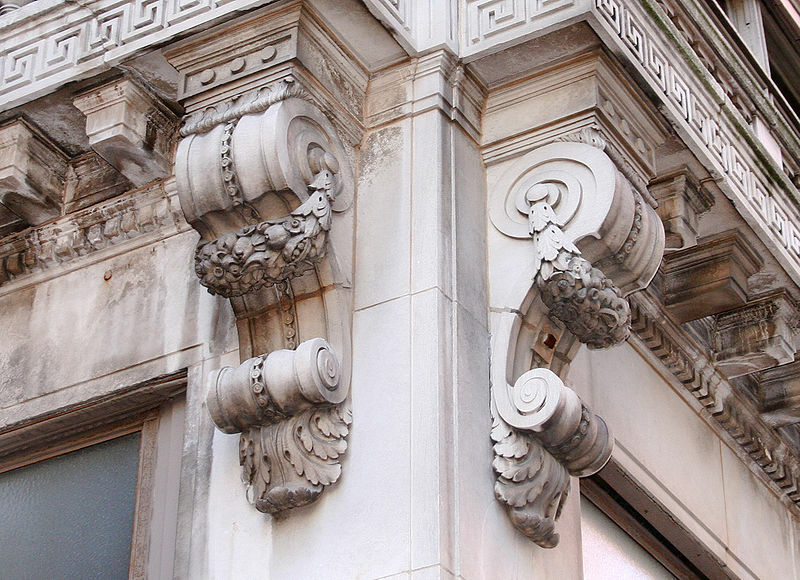 Auckland has, however, a set of very precious corbels, cast away from their original home by demolition in the mid 1930s, and still on somewhat of an odyssey in the city even today. 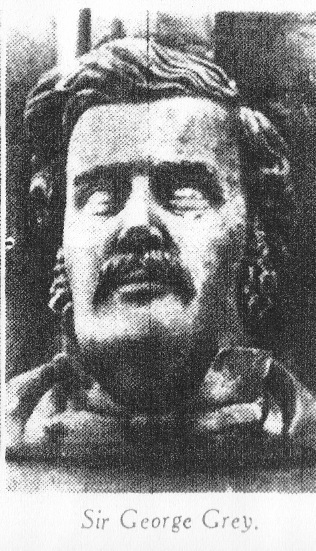 Anton Teutenberg carved several portrait heads and corbels to decorate the exterior of the Shortland Street Post Office. Teutenberg is said to have learned to carve wood with a pocket knife during his voyage to New Zealand. The sculptures included members of the English royal family and Maori chiefs and their families as well as colonial administrators." As happens so often around here with a Timespanner topic -- I just kept being more and more intrigued. Asking more questions. Deciding that it was worth tracking between the NZHPT office, the Auckland War Memorial Museum display areas, their Museum Library (my thanks also to the very helpful staff there, who dug up some archive information for me), the Auckland Research Centre at the city central library for the Auckland Scrapbook information and newspaper reels -- and dear old Papers Past here at home. 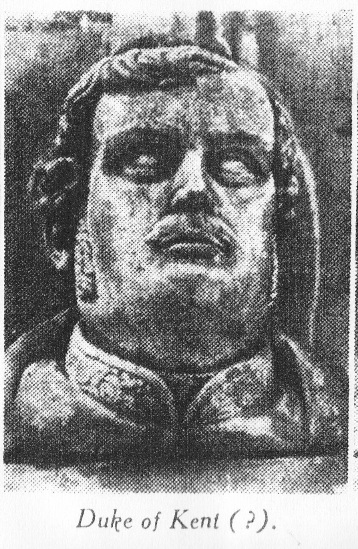 Soon after his arrival Teutenberg received a commission to carve heads for the Supreme Court building being erected under the supervision of architect Edward Rumsey. He had carved a piece of filigree woodwork for the captain of the Rob Roy, who had shown this work to Rumsey. For 15s. a day he carved six major heads in stone – a medium he had never before handled – and a number of gargoyles, along with a series of wooden heads for the gallery of the court room. He was next invited to sculpt heads for the post office building in Shortland Street, but now asked and received 20s. a day. He carved 11 heads in stone, five of them Maori, and a line of corbels showing the spread of the British Empire. There is a slight error there -- for the Shortland Street Post Office, which was Auckland's Central Post Office from 1868 until the Queen Street building took over in 1912, Teutenberg carved ten heads, not eleven. Considering the twists and turns of the saga of the corbel heads which you'll see, though -- I'm not surprised that such a mistake has crept into the Dictionary of New Zealand Biography as well. From 1905. 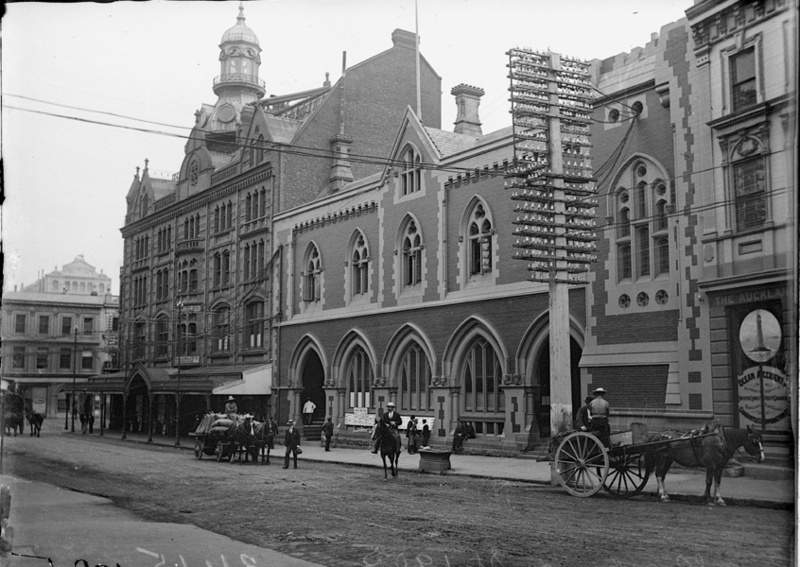 "Looking west along Shortland Street showing the corner of Queen Street (far left), Victoria Arcade (right) and Shortland Street Post Office (centre), pedestrians, horse and carts, man on horseback," reference 4-2415, Sir George Grey Special Collections, Auckland Council Libraries. I really wish I could have seen this building. The Shortland Street Post Office, actually starting out as a combined government building for both Customs and the post and telegraph services, was begun in 1866, expected to be complete by July 1867, but actually took until around April 1868. But the Southern Cross on 3 January 1868 was extremely positive. The facade fronting this street is in the Gothic style. The ground floor consists of five arches, surmounted in the upper floor with two-light pointed windows. The front is surmounted with an ornamental corbelled parapet. There are a number of finely-carved figure-heads ornamenting the façade, representing the Queen, Prince Albert, Prince of Wales, Empress Alexandra, the Governor, the Bishop of New Zealand, chief Paul, the late chief William Thompson, and another celebrated native chief and his wife. This noble building forms an important and handsome addition to our street architecture, and will be highly ornamental to the part of the city where it stands. It has been erected from designs prepared by Mr. E. Rumsey, architect, and under his superintendence. Mr. Farrow is clerk of works, and Mr U Hurrell, foreman. "... carved corbels representing the faces of illustrious and well known personages as Her Majesty and the late Prince Consort, the Prince and Princess of Wales, Sir George Grey, and the Bishop of New Zealand; the Chiefs Tamihana, and Paora of Orakei, all of which are excellent likenesses." By 1936, the Auckland Star was guessing who the heads were meant to represent. 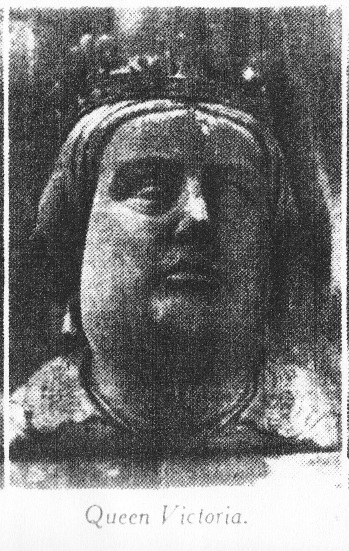 The article "History in Stone" and its accompanying captioned illustrations which appeared 15 February that year, has influenced identifiers of the Teutenberg corbel heads from the old Post Office ever since -- and not necessarily in the right direction. This was the first sign that things were going awry. The Star assumed that this was Te Hira Te Kawau, son of Apihai Te Kawau of Ngati Whatua. But -- Te Hira did not succeed his father until the latter died in 1869, a year after the building was completed. 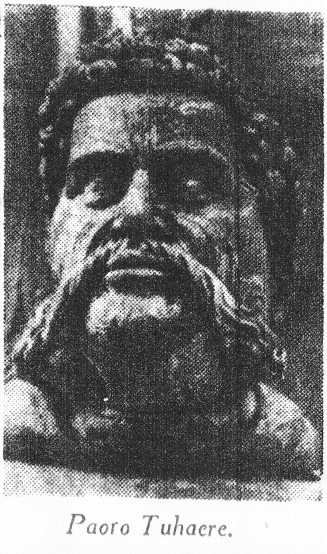 Both the Southern Cross and the NZ Herald in 1868 identified one of the heads as being a likeness of Wiremu Tamihana ("William Thompson"), also known as the Kingmaker, who was very well-known when Teutenberg prepared his carvings. His death in 1866 would have been a current event at the time. 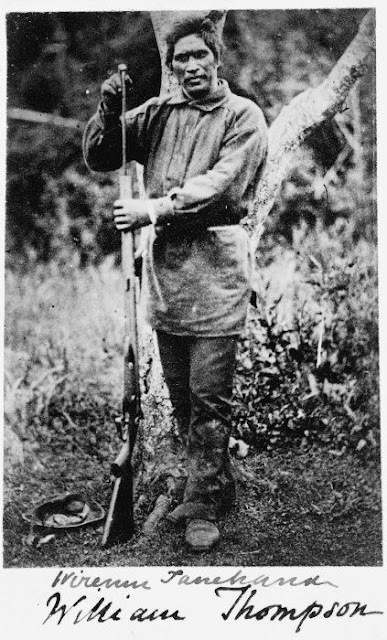 Wiremu Tamihana Tarapipipi Te Waharoa with a double barreled shot-gun, 1863, Reference Number: 1/2-019840-F, Alexander Turnbull Library. According to the NZHPT file, the Trust holds this carving, but they have also misidentified it as that of Te Hira Te Kawau. This one is correct (apart from the spelling), and is the Maori head currently displayed at the NZHPT Auckland office -- the one that started this hunt for me. 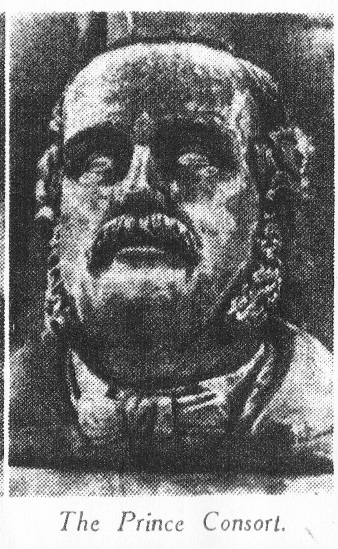 Paora Tuhaere, known as "Paul" to the European settlers in 1866-1868, was a prominent Ngati Whatua chief. 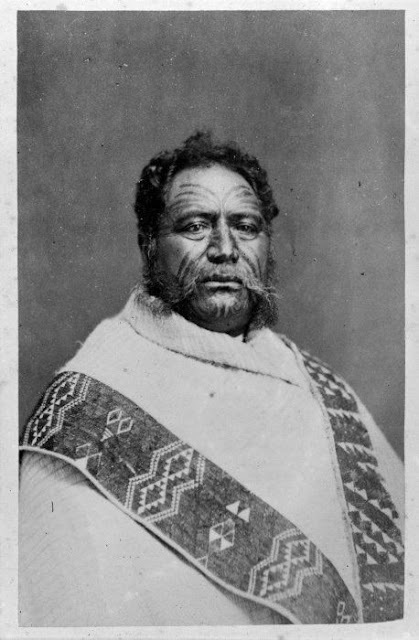 Paora Tuhaere, [ca 1875]. Ref 1/2-073329-F. Paora Tuhaere, with a moko, circa 1875. He wears a Maori cloak. Photographer unidentified. Alexander Turnbull Library. Another one that hasn't been misidentified. Hard to miss the distinctive features of Governor Sir George Grey. This is held by NZHPT today. Correct, also. This is on display at the NZHPT Auckland office (see top). 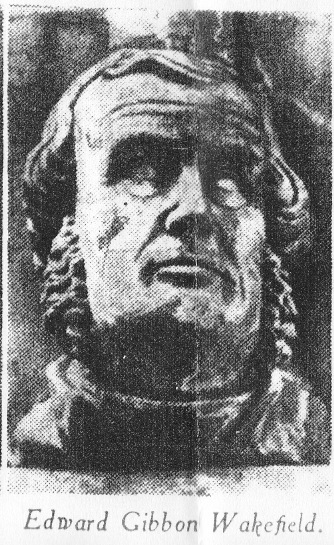 Held at the Auckland Museum, who correctly identify this head as Bishop George Augustus Selwyn, the NZHPT list still identifies it as Edward Gibbon Wakefield. Considering Wakefield's impact on the founding of the Wellington settlement, and Auckland still smarting from 1865 over losing the right to call ourselves the capital of the colony in favour of that southern city -- this was not a good guess on the part of the Star. 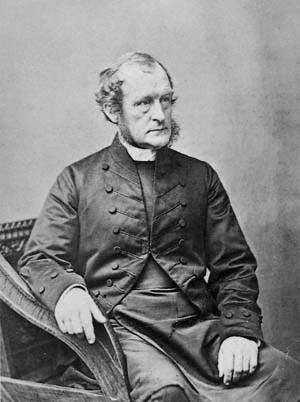 Bishop Selwyn, 1875, from Wikipedia. NZHPT have this one correctly identified, however. Prince Albert, 1848. From Wikipedia. Why would the Star have surmised that this was a Duke of Kent (and his wife, the Duchess, below)? The one almost holding that title at the time of the building of the post office was Queen Victoria's son, Prince Alfred, Duke of Edinburgh (he was Earl of Kent). But if the dashing and famous Prince Alfred had been included, that would have been the name included in the Southern Cross and the Herald in 1868. Late in the 20th century, in a bit of a scramble to make sense of things, it was theorised that this one, and the one below, were Queen Victoria's parents. 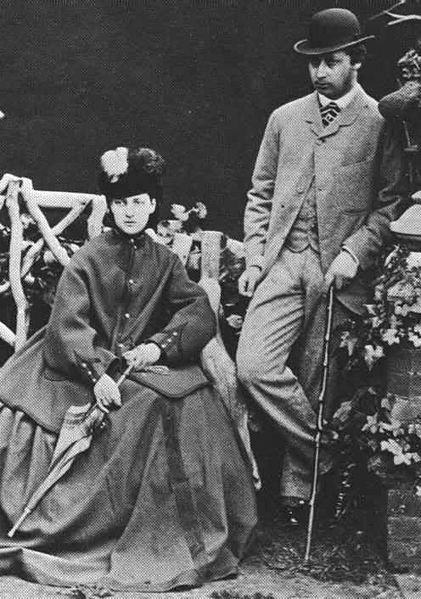 But really -- I'd go with what the two newspapers said, contemporary to the completion of the post office: these are of Prince Albert Edward, Prince of Wales, and his (then) relatively new bride, Princess Alexandra of Denmark. Engagement photo, 1862. From Wikipedia. 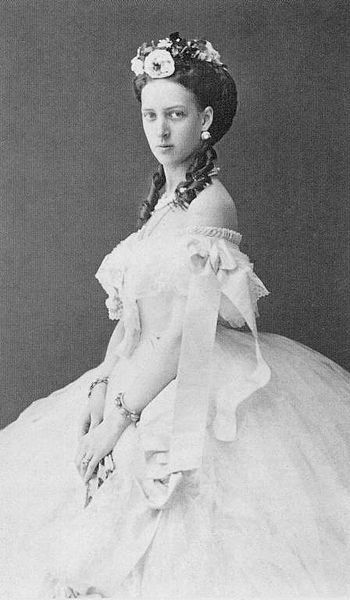 A younger Alexandra. Notice the ringlets -- a feature Teutenberg tried to capture. Today, misidentified both by NZHPT and the Museum, the head is on display at the latter. We are down to the two described by the Southern Cross in 1868 as "another celebrated native chief and his wife." The Auckland Star identified this one as representing Motire Toha, but for some reason the part about "a celebrated chief and his wife" was missed. 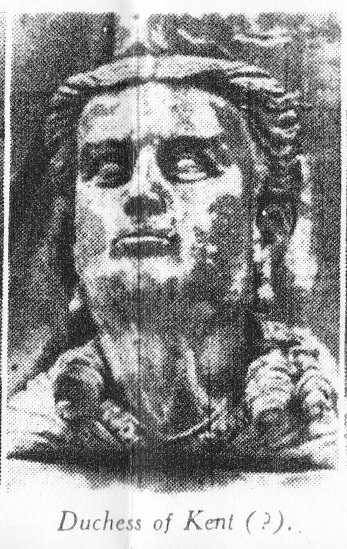 As NZHPT also identify this one as Motire Toha (and, with no images yet found, I can't say whether that is correct or not, so I'll accept it for now), this means the tenth corbel head in the set is that of her husband, Kati Takiwaru, younger brother of Potatau Te Wherowhero, the first Maori King. 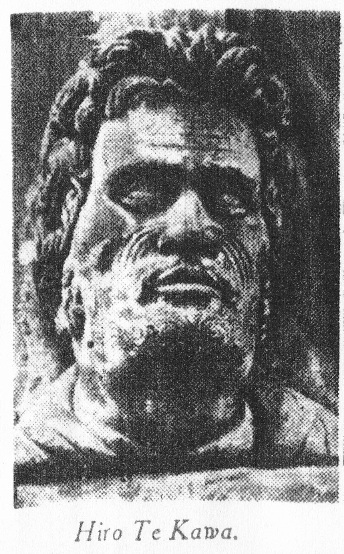 Kati Takiwaru was associated with the Maori settlement at Mangere along with Tamati Ngapora, and is buried there. "Sacred to the memory of Kati Takiwaru, a chief of the Waikato, and younger brother of Te Wheoro-Wheoro, who, with his children and grandchildren, descendants of Tapene their ancestor, is buried in this tomb. This stone is raised to their memory by the Government of New Zealand, during the administration of George Grey, Premier, and John Sheehan, Native Minister, in the month of September, 1878." Images of Potatau Te Wherowhero are few and far between. 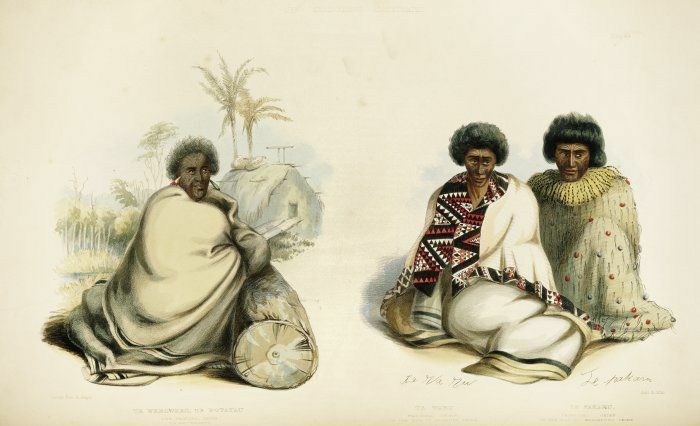 This illustration (seated left, from the Alexander Turnbull Library, ref. 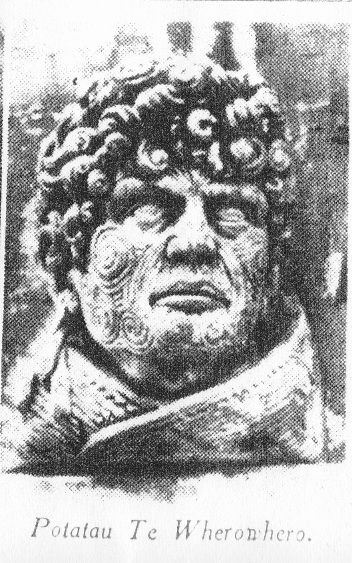 PUBL-0014-44) indicates wavy, curly hair as in the Teutenberg head -- but the sculpture could just as easily be his younger brother (for whom there are no available images). Matire Toha wasn't married to Potatau Te Wherowhero, so that identification isn't correct. She wasn't married to Hone Heke either, but that didn't stop the head being identified as such in the 1960s by NZHPT's Auckland committee. The list at NZHPT doesn't include the Kati Takiwaru scuplture, but I'd say it may well be in their safe-keeping. They do hold the one identified as Matire Toha, his wife. 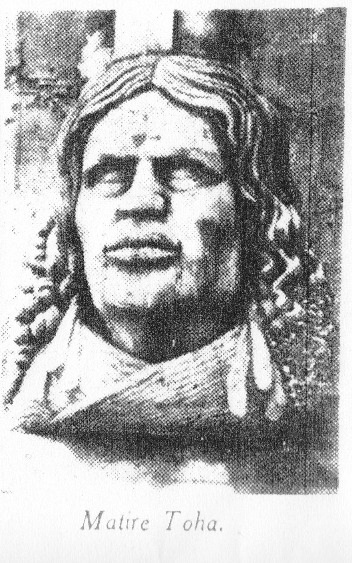 The main Teutenberg corbel heads from the Post Office, possibly along with as many of 12 smaller sculptures from the building, had been intended for the Old Colonists' Museum. "In 12 smaller ones the artist has simply let his fancy run: two are of women in bonnets and the rest mostly of bearded warriors. The remaining four are grotesque animal heads, two having drainpipes issuing from their mouths. In any event it is to be hoped that the rest of the sculptures will be preserved in the Old Colonists' Museum or elsewhere as relics of early Auckland." The Museum has three gargoyles, NZHPT one (on an uncut block). Above are two of the Museum's gargoyles -- the top misidentified as Hone Heke. Why, I just don't know ... perhaps because of the tongue sticking out? Could just as much be some cheeky larrikin. The identification, without evidence, is dubious. The Old Colonists' Museum (site of the City Art Gallery today) never received the sculptures. For some reason or other, they ended up stored in the basement of the Auckland Town Hall. This came to the attention of the Auckland Committee of what was then the National Historic Places Trust, who wrote on 29 May 1957 to the Council's Town Clerk enquiring about them. In response, A J Dickson, City Engineer and Director of Works, advised that they would be stored carefully so as not to cause damage, and that the committee could go along to inspect them. This meant shifting the sculptures to a works depot at Freemans Bay. The Committee applied to the Council for them to take over care of the sculptures, and the Council agreed on 19 August that year. The committee immediately entered into discussions with the Supreme Court, to obtain space for the sculptures there. ... my committee have made arrangements for six stone heads from the City Depot to be mounted in the vestibule of the Supreme Court, the actual work being in the care of Mr E A Lawry, member of the Committee and a registered architect in practice in Auckland. At its last meeting the Committee considered what might be the best thing to do with the balance of the heads, some of which are not seriously damaged. It was thought that a few could, with advantage, be used in City parks and reserves as it would seem difficult to justify them being deposited in some dump. It was also thought that after the City had made use of those it required, perhaps the rest might be offered to Citizens of Auckland who might be interested and could use them as garden ornaments. E A Lawry worked with Draffin & Lawry, architects. The sculptures were worked on by Parkinson's monumental masons. F J Gwilliam the Town Clerk replied that the Director of Parks viewed them as unsuitable for the City's parks, but that the committee might go ahead on its own behalf with the idea of offering Aucklanders a piece of Teutenberg sculpture (I'm presuming they meant the lesser gargoyle ones) as "garden ornaments." 24 October 1962, the committee wrote to the Registrar of the Supreme Court. ... suitable pedestals are now ready to support eight sculptured heads of European and Maori notable persons of a century ago. They will stand about shoulder high ... A suitable legend explaining these personalities will be attached to each piece of statuary to inform the public of the historical merit of the display. If the committee did install "legends" beneath the sculptures, 50% of them would have been in error. By February 1963, the committee already had the heads on display -- in Milne and Coyce's Queen Street windows (at a time of a Royal Visit). By April, the Supreme Court advised they only had space to display six of the heads. The committee asked if the other four could be stored in the court's basement for the time being. By February 1964, the number to be mounted at the Supreme Court had dropped to five; the committee contacted the Auckland Institute and Museum, asking if they would accept a donation of two of the other heads, "one Maori chief and one Maori woman". These may have been Wiremu Tamihana and Matiri Toha. The Museum apparently accepted -- but access to the court basement was blocked off due to renovations for three months. The committee asked the Museum to wait. In the end, after the renovations were completed, six heads went up on display at the Supreme Court -- and the Museum ended up obtaining four: "Wakefield" (Bishop Selwyn), Prince Albert, "Duchess of Kent" (Princess Alexandra), Wiremu Tamihana, and Matiri Toha, judging by the images of the six the committee held onto for the Supreme Court display. (Herald, 18 July 1963) This lasted into at least the early 1970s. At some point since then, though, the Museum and NZHPT have entered into a 20 year loan agreement for four of the heads and three of the surviving gargoyles to be located at the Museum -- although, with the confusion between "Wakefield" and Bishop Selwyn, it isn't entirely clear from the NZHPT list compiled perhaps much more recently which heads the Museum actually does or doesn't have: the whereabouts of that of Kati Takiwaru (identified publicly as both Potatau Te Wherowhero and Hone Hika by NZHPT in the 20th century) isn't recorded. I think, perhaps, the sculptures should cease to be so divided between the two institutions, and go to where it was intended that they be: the Auckland Art Gallery, the site of the Old Colonists' Museum, and a place where the set could be together, instead of splitting Queen Victoria from her beloved Albert (she would not be amused at such an arrangement! ), and King Edward VII from his Alexandra. The ten heads faced Shortland Street from beside and beneath the entry arches of the old Post Office from 1867-68 until 1936. I think they should be together again. With all their correct names. Please. Seems odd for museums to get things so wrong. Fortunate that you are around to correct them. As I said -- the museum's (and anyone's) info is only as good as has already been provided or ascertained. My friend Liz would probably tack on to that the stuff in the museum about Rajah the elephant, as well. Exactly Lisa. I agree these are important works of significant art history. Where the grotesques go what is significant about those is that they are very much in Italianate style. You would find for example the one with the goat horns can be found in places such as Florence, Rome and Venice. It's most likely a representation of the God of Wine Bacchus. Bacchus I have seen represented in this manner in sculpture. I'm no art history expert but I'm glad I did take a paper in it in sixth form at Avondale College. This group in its entirety should be conserved and installed at the Auckland Art Gallery to celebrate the life and works of this very important and talented sculptor. Wonderful work Lisa.! Motat I think has/had some of Anton's work, including a Gargoyle.. in the old Numisatics dept. (Possibly gone under the recent regime..? ) I was looking up Ed Lawry for my Lost Property site (thanks for that..!) He also did a lot of wok for Thorpe Cutter Pickmere & Douglas I think. Great drawings, some of which turned up recently at Manukau Reseach Centre (Library..) in a folder. Thanks. I shouldn't be cynical, I'm sure they mean well, but in terms of the errors, I'm not holding breath. I have just discovered your blog on Teutenberg. I can add little but to say thank you for identifying the heads. What I CAN add is that the Numismatic Society of Auckland (which has a collection of his equipment, dies etc) had a gargoyle, but it disappeared. We understood that the gargoyle - which wasn't all that pretty - had been stored at Sylvia Park, but it never reappeared. It didn't look like much more that a ragged lump of stone. Street Stories 18: Why Lincoln Road?